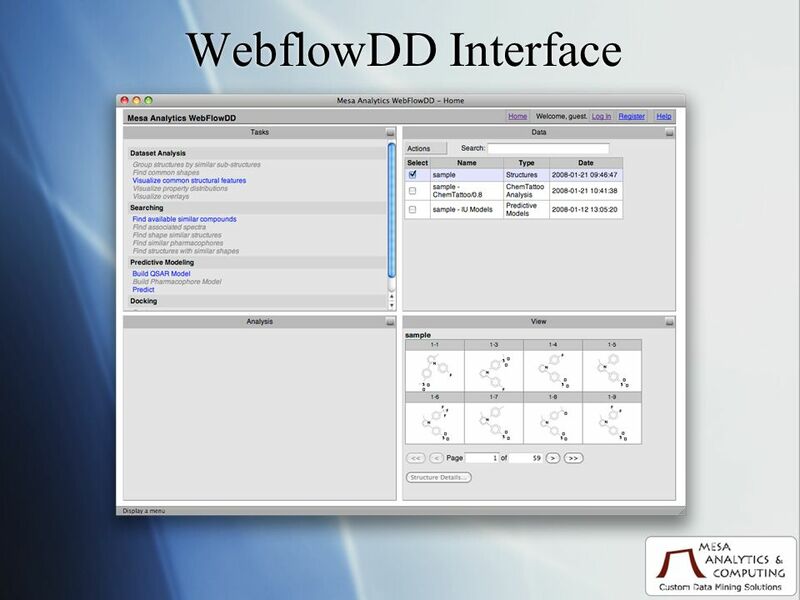 2 ABSTRACT The dynamic Web application, WebFlowDD, introduces synthetic organic chemistry students to the world of drug design through a pharmaceutical industry workflow. 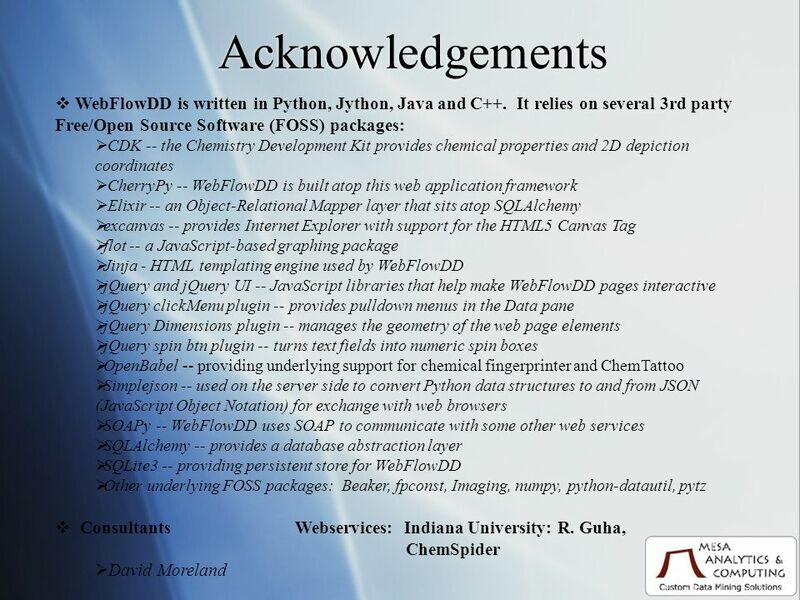 Students and researchers have access to simple tasks that are commonplace in an industrial setting and have the opportunity to run a variety of freeware and Web- services as they tackle synthetic challenges in drug design. 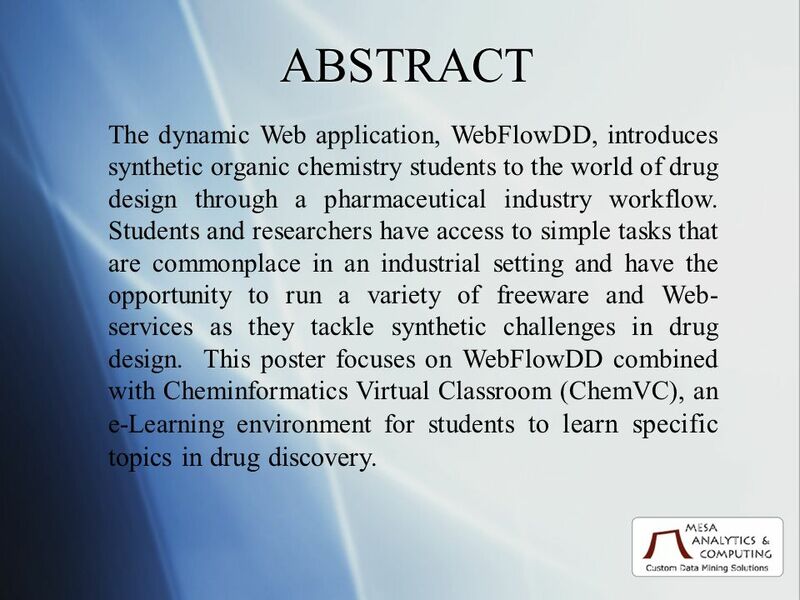 This poster focuses on WebFlowDD combined with Cheminformatics Virtual Classroom (ChemVC), an e-Learning environment for students to learn specific topics in drug discovery. 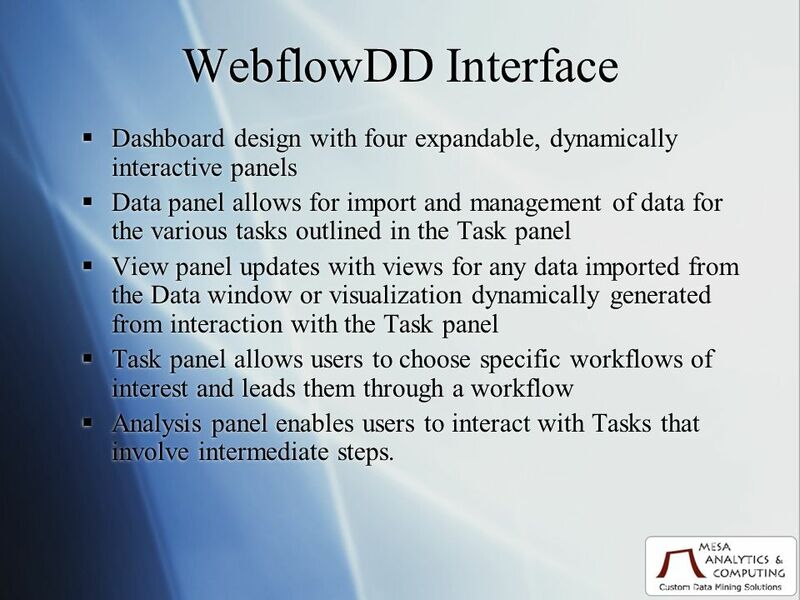 4 Dashboard design with four expandable, dynamically interactive panels Data panel allows for import and management of data for the various tasks outlined in the Task panel View panel updates with views for any data imported from the Data window or visualization dynamically generated from interaction with the Task panel Task panel allows users to choose specific workflows of interest and leads them through a workflow Analysis panel enables users to interact with Tasks that involve intermediate steps. 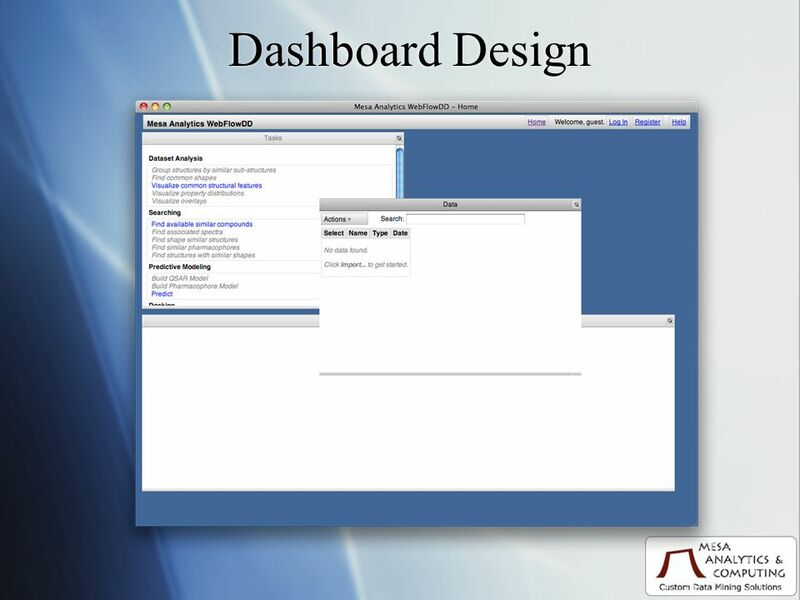 Dashboard design with four expandable, dynamically interactive panels Data panel allows for import and management of data for the various tasks outlined in the Task panel View panel updates with views for any data imported from the Data window or visualization dynamically generated from interaction with the Task panel Task panel allows users to choose specific workflows of interest and leads them through a workflow Analysis panel enables users to interact with Tasks that involve intermediate steps. 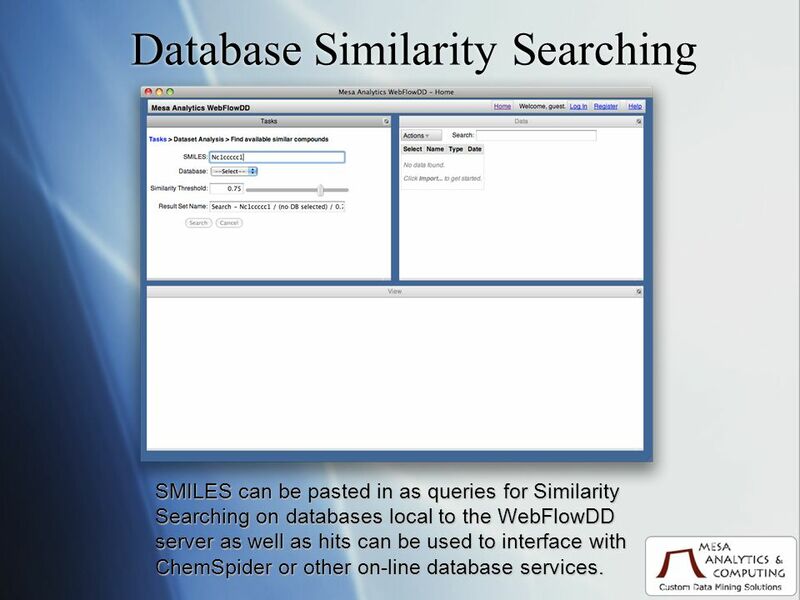 7 Database Similarity Searching SMILES can be pasted in as queries for Similarity Searching on databases local to the WebFlowDD server as well as hits can be used to interface with ChemSpider or other on-line database services. 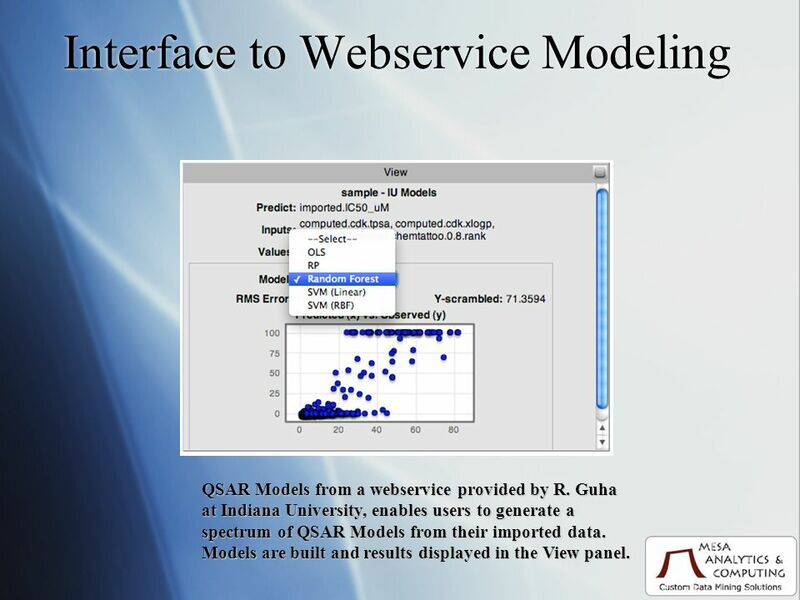 9 Interface to Webservice Modeling QSAR Models from a webservice provided by R. Guha at Indiana University, enables users to generate a spectrum of QSAR Models from their imported data. Models are built and results displayed in the View panel. 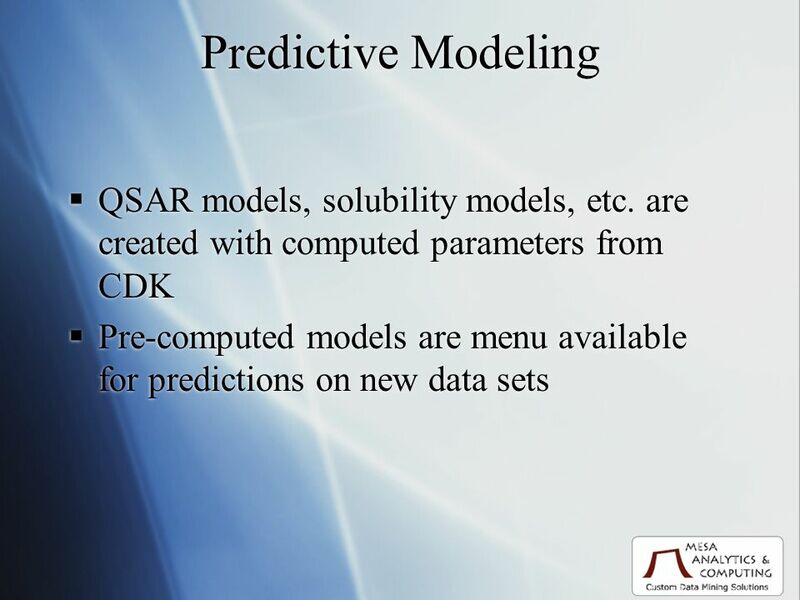 11 Predictive Modeling Example Predictive Modeling workflow. Users chose a parameter set to build a model. 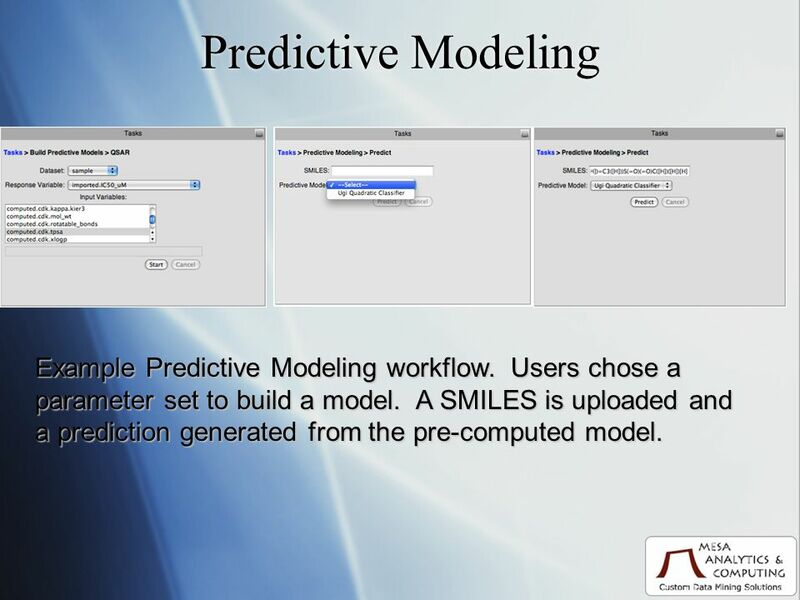 A SMILES is uploaded and a prediction generated from the pre-computed model. 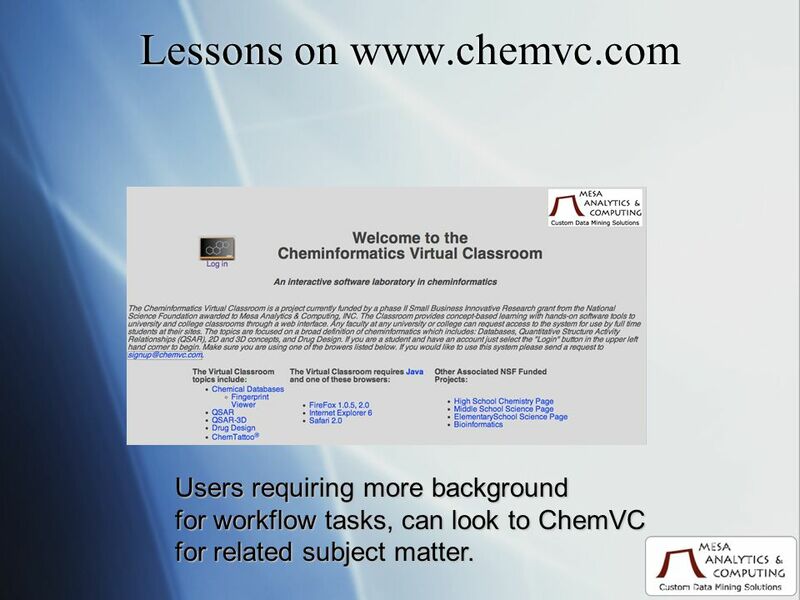 12 Lessons on www.chemvc.com Users requiring more background for workflow tasks, can look to ChemVC for related subject matter. 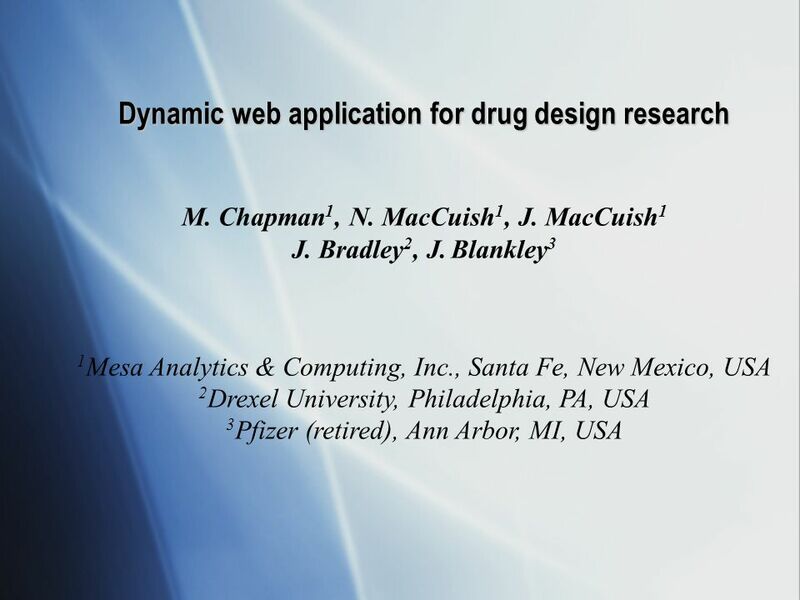 Download ppt "Dynamic web application for drug design research M. Chapman 1, N. MacCuish 1, J. MacCuish 1 J. Bradley 2, J. Blankley 3 1 Mesa Analytics & Computing, Inc.,"
17 HTML, Scripting, and Interactivity Section 17.1 Add an audio file using HTML Create a form using HTML Add text boxes using HTML Add radio buttons and. 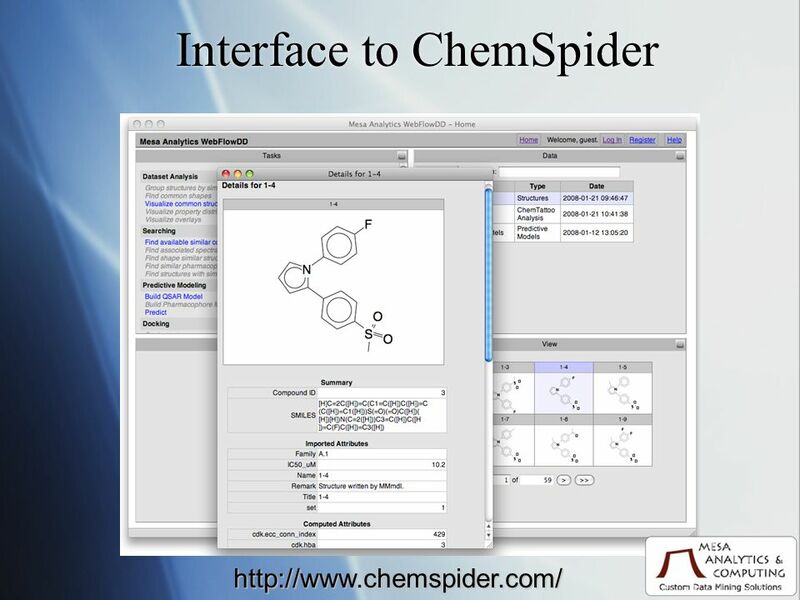 Integrating ChemAxon technology into your End User Applications Java solutions for cheminformatics Ver. Mar., 2005. SOMA2 – Drug Design Environment. 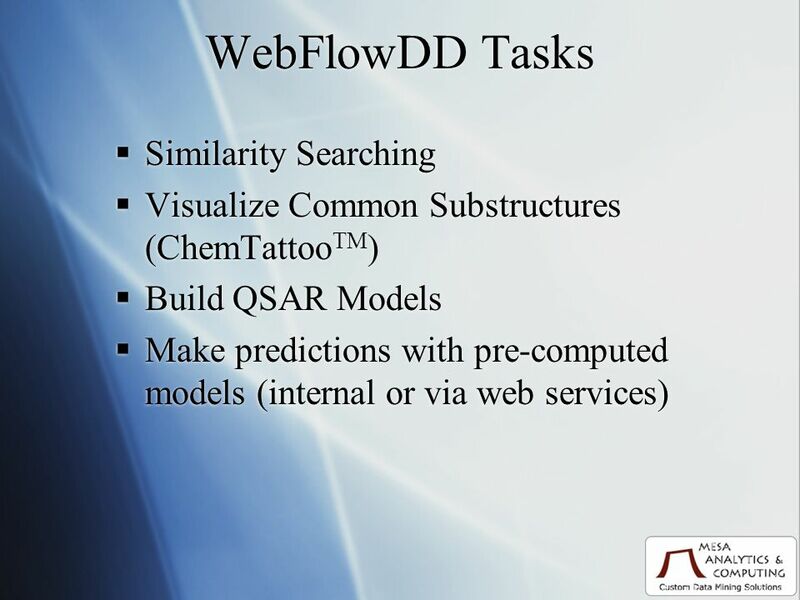 Drug design environment – SOMA2 The SOMA2 project Tekes (National Technology Agency of Finland) DRUG2000 program. Behzad Samin 0 An End-to-End Overview of a RESTful Web Service. Pulan Yu School of Informatics Indiana University Bloomington Web service based Varuna.Net. Kensington Oracle Edition: Open Discovery Workflow Meets Oracle 10g Professor Yike Guo. Pasewark & Pasewark Microsoft Office XP: Introductory Course 1 INTRODUCTION Lesson 1 – Microsoft Office XP Basics and the Internet. Building New SOA and AJAX- Based Business Applications Mark Barnard R&D Manager – Natural Business Services Software AG (Canada) Inc. Copyright 2004 Monash University IMS5401 Web-based Systems Development Topic 2: Elements of the Web (g) Interactivity. 1 Computing for Todays Lecture 22 Yumei Huo Fall 2006. Macromedia Dreamweaver 4 Advanced Level Course. Add Rollovers Rollovers or mouseovers are possibly the most popular effects used in designing Web pages. 14 1 Chapter 14 Database Connectivity and Web Development Database Systems: Design, Implementation, and Management, Seventh Edition, Rob and Coronel. National Center for Supercomputing Applications NCSA OPIE Presentation November 2000.